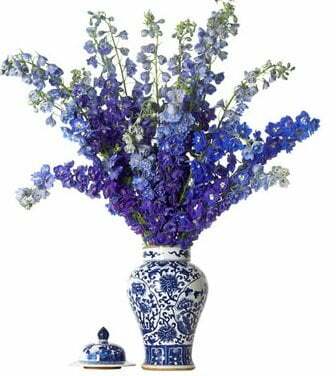 Blue and white china was originally the foundation of all blue and white decorating. It's no longer the core of blue and white decorating, like below. Instead you can find blue and white in cushions and throw pillows, painted floorboards and even blue wallpaper like these from Graham Brown. The great thing about wallpaper is you don't need a lot to line the back of some bookshelves or create an amazing entry. 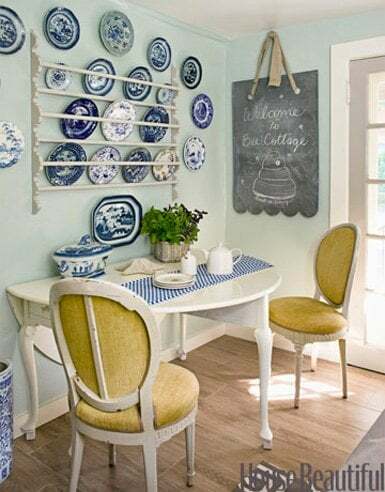 Here are two great videos from ehow called Blue and White China Patterns and Types of Blue and White China, so if you decide to collect you will know where to start. I've even added the video transcripts so you won't miss any details on blue and white china. Just to show you some of the detail that you can find in some of these patterns looking at this teapot you can see if I take off the cover you can see when I pick up the pattern. How detail it is you have a woman leaning up against the trees here with a waterfall and in the background you have cows that are in the pasture here and more trees in the background. There's a large estate here with tress flowing all around and in another pattern that starts up here on the border with flowers and like a horn of plenty with leave patterns in it. Again you see another border with more flowers and more patterns so you can see the detail that's added in here with more detail here and on the spout you can see the flowerer pattern that runs up the spout. Usually you would see some detail on the handle of the teapot too, so this is a really intricate pattern, very detailed and very deep blue but you can also see how crisp the pattern is. You can see the event actually it almost step into there and see that there's a person sitting out there on a nice afternoon watching the cows grazing on the field. These are great pieces that show wonderful events that were happening in the 1830s so this is one example showing on the teapot and we'll show you some other examples here. Here is one with a bird pecking at the seeds on the end of the flower you can see the detail of the stems with a very distinct pattern in the background which is just like a dot pattern. But it sets off the background so that you can see the detail on the birds feathers and the flowers the peddles and in the back of the handle you can also see little flower patterns here. So they didn't leave anything on this pattern empty the whole bowl the spout here has patterns and boarders all the way across the top with leaves and detail on the flowers. So this something you'll see in the historical blue the detail is tremendous for the period so this is a nice example of a pitcher a milk pitcher with a bird and flower pattern. What is Flow Blue? A Type of Blue and White China! 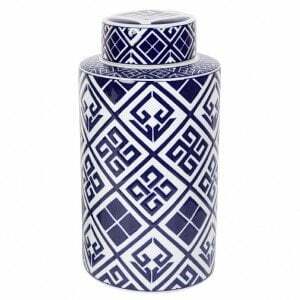 Whether it is one piece or a whole set of flow blue china there are great ways to use it in traditional decorating or new and very cool ways - like convert your ginger jars into lamps. 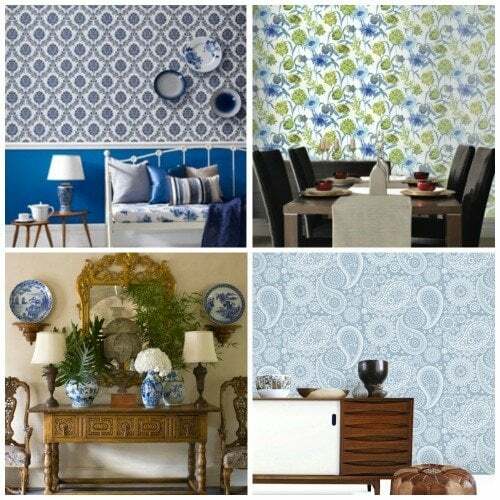 And if blue and white china is too much, them maybe a little blue and white wallpaper is all you need to get your traditional blue and white fix. 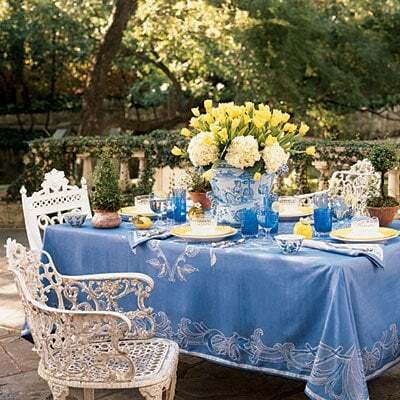 What do you think about blue and white china? Send in any new ideas on how to use it, what new patterns you may have found and what you love about it. Join our Free Newsletter here and visit our Facebook page here.